WARNING: This is a preview of Assembly. All components and rules are prototype and subject to change. A deadly virus has spread across the orbital platform, killing nearly everyone onboard, but you and another crew member seem to have a natural immunity. The two of you are looking to escape the platform to help develop a vaccine before the virus reaches Earth. To do that, you'll have to complete one of the half-finished spaceships on the platform using the limited controls at your disposal. Unfortunately, the computer has other plans. It has quarantined the platform and is currently venting the life support systems to prevent the virus from escaping. What's worse, the computer is listening in to your comms and will try to block your progress in whatever way possible. Can you finish prepping your escape route before the oxygen is gone? 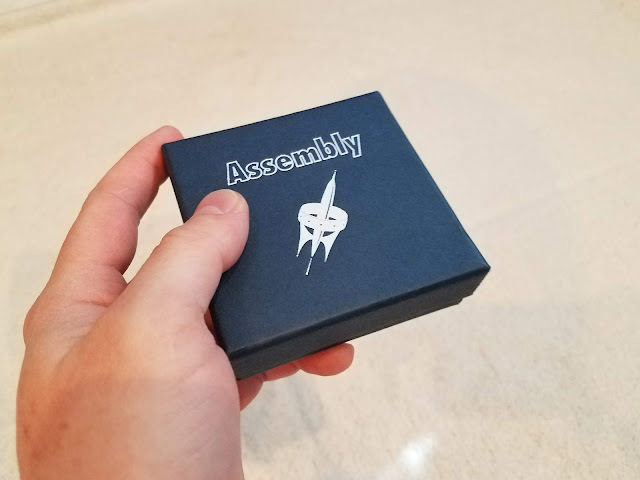 Assembly is a dual puzzle and card game where every moment counts. Your goal is to move Room Modules around the board until they match up with their respective Bay cards. Locking down all 12 rooms means your freedom. But beware - one poorly played card could spell your doom! Perhaps the smallest box I've gotten to review yet. 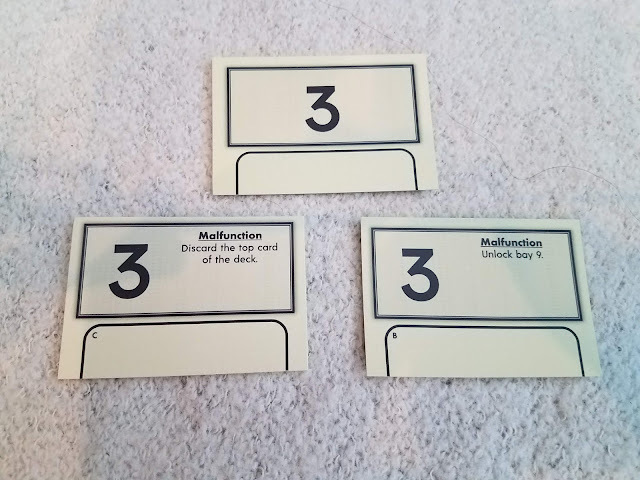 The rules of the game are simple: players must cooperate to move the ship's Room Modules onto their proper Bay cards into place if they wish to escape. This is done by playing one of the three types of Command cards: Draw/Lock, Swap, or Rotate. 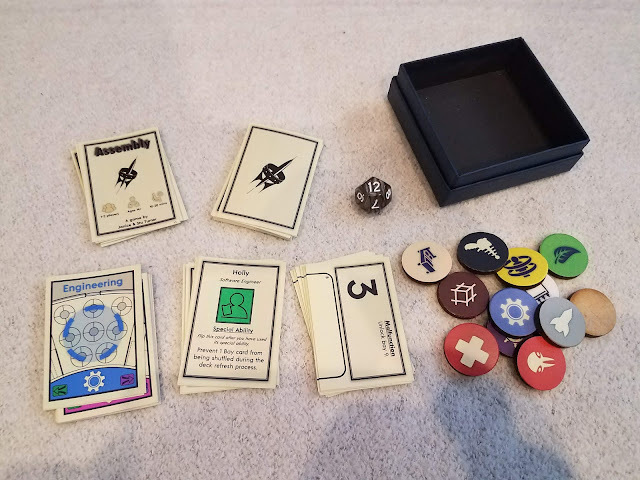 Draw allows a player to place a new Room Module onto the table, while Lock secures it into place on its matching Bay card; Swap and Rotate allow you to move rooms around the table in an attempt to get them to their proper bay. The game quickly becomes a mind puzzle as Swap and Rotate cards cause all modules to move in tandem, forcing you to think three moves ahead for everything to fit into place. On your turn, you choose which command you want to execute, based on one of the Command cards in your hand. Your teammate must then tell you whether they can verify that command (i.e. they have the same card) or not. Then, you declare your action for the turn and discard the matching card. You can play a card even if your teammate cannot verify it, but they'll have to discard a card, as well. After the action takes place, you draw up to your full hand, and your teammate takes the lead. After the deck has been gone through and shuffled three times, the game ends in failure; however, if you're able to lock the final room in place before then, success (and your life) is yours! Turns out you can cram a lot of stuff into a box that size! 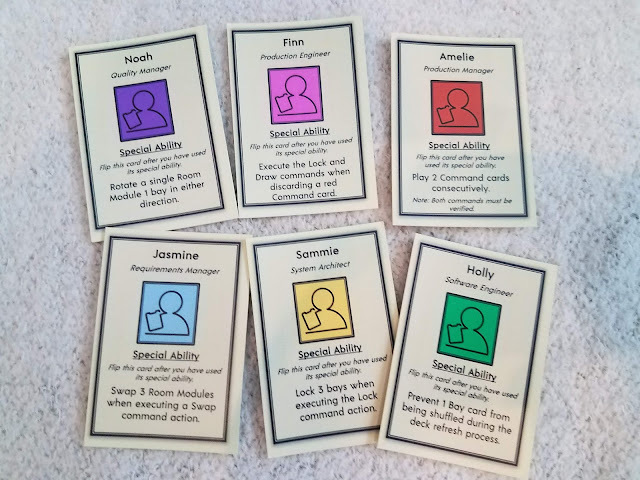 To set the stage, separate out all the different types of cards (Bay, Bay Number, Command, Role, and Player Aid), the Room Module tokens, and the 12-sided die. Each player gets a Role card that is placed in front of them; this will be their character for the game, giving them a unique ability. The Room Modules are shuffled and placed in a stack, facing down, and the Bay Number cards are placed in a circle around them in the same positions as a clock face. The Bay cards are then shuffled and placed in the circle, and one of the Room Modules is placed on a Bay card (the die is rolled to determine where it starts out). Two of the Command cards are set aside, while the rest are shuffled into a deck. Each player gets three Command cards as their starting hand, and the race to escape begins! The bays are in place... until the computer decides to move them around, that is. Assembly does not hesitate to put its all into the theme. Each room would be right at home on a futuristic spaceship (Engineering, Hydroponics, Medical, etc. ), and a majority of the rules of play contain a small bit of exposition to rationalize them as part of the story that the game is trying to tell. The mechanics of word choice and coordination, framed as the computer acting against you, is genius; the trope of a rogue AI can be seen in everything from 2001: A Space Odyssey to WALL-E. All of these little pieces add up to making a game that draws you into its world and keeps you there until your last breath. Each Bay card has a matching Room Module. 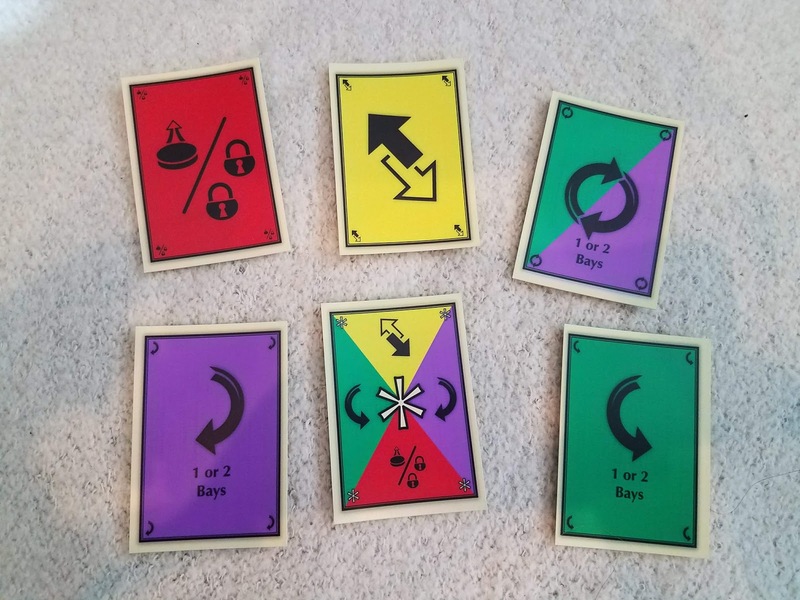 The game's mechanics focus mainly on balancing your hand with your teammate's as you move the Room Modules around to their respective Bay cards. While relatively simple, it's also incredibly tricky, considering you don't know exactly what your teammate has, and every newly placed Room Module can force you to rethink your entire strategy. It truly is a puzzle in board game form. Perhaps the most interesting mechanic is in regard to conversation between you and your teammate: you're not allowed to say the names of any of the Command cards (Draw/Lock, Swap, and Rotate). If you do, the computer "shuts off" the lines of communication, and all dialogue ceases until your turn is over. Your conversation quickly becomes a game of charades, ramping up the difficulty of making sure your teammate can match your card. Once you get the appropriate Room Module to the right Bay, you can lock it into place. When I say this game is tight, I mean it. It's intense enough to make Pandemic veterans shake with fear. Every decision you make can complicate the future if you're not careful, as every card played brings you closer to death. Because Draw and Lock commands inhabit the same card, you have to choose wisely between the two. Do you place another Room Module on the table, knowing it might screw up your current plan? Are you willing to only use one of the two Lock commands to secure a room into its bay before the computer shuffles the Bay cards around the table? Many of our games were decided on within the last few cards, and several ended with us losing. Luckily, each game took less than 20 minutes from setup to finish, so it was easy to jump back in for another attempt. And if fast, intense gameplay weren't enough, the designers went an extra step. The game includes rules to increase or decrease the difficulty, the option to add "malfunctions" to give the computer an extra edge, and a solo mode if your go-to teammate is otherwise unavailable. Options like these increase replayability with ease. Some examples of malfunctions, which are activated when you lock a Bay card that sits on the malfunction. 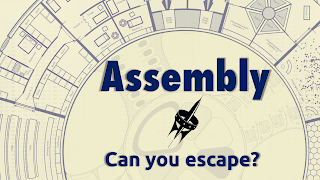 The artwork for Assembly is relatively minimalist, but that doesn't mean it's nonexistent. Each of the twelve Bay cards has a unique room design that looks like it's been pulled directly from a blueprint (bringing back the game's theme - assembling a spaceship). 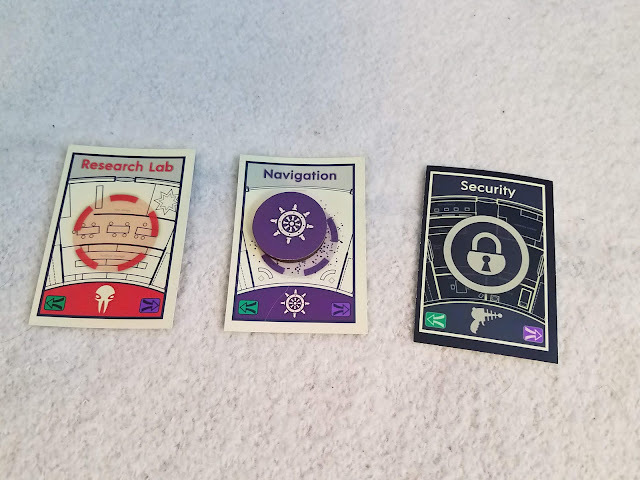 Each Bay card has a unique color and symbol to help it stand out, and each Room Module has a matching color and logo. The sleek font design on the cards makes them easy to read, and the inclusion of bright colors helps to easily differentiate between rooms, commands, and characters. Technically, there are six types of Command cards: Draw/Lock, Swap, Rotate Left, Rotate Right, Rotate Either, and Wild. All told, the game comes with 46 cards, 12 Room Module tokens, and a 12-sided die. The cards are currently small in size, about as tall as an average adult's pinky finger. 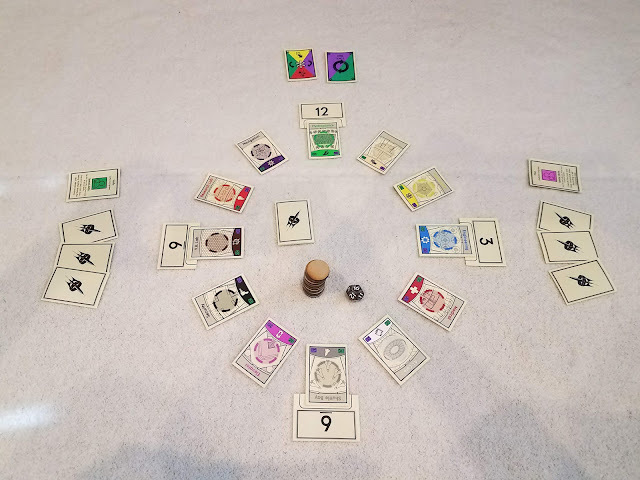 The designers have mentioned possibly making them the standard poker size during the Kickstarter campaign, but I personally prefer them the size they are. It makes the game more portable and allows it to be played almost anywhere. 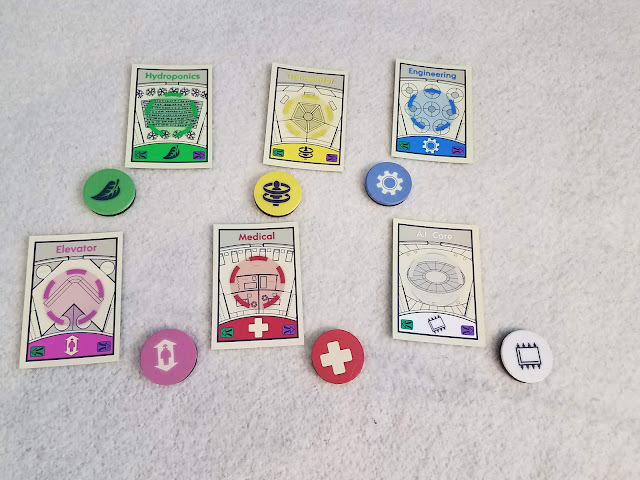 Regardless of size, the cards and the tokens are sturdy, and these are just prototypes! Minimalism doesn't have to mean boring - it can simply mean streamlined. 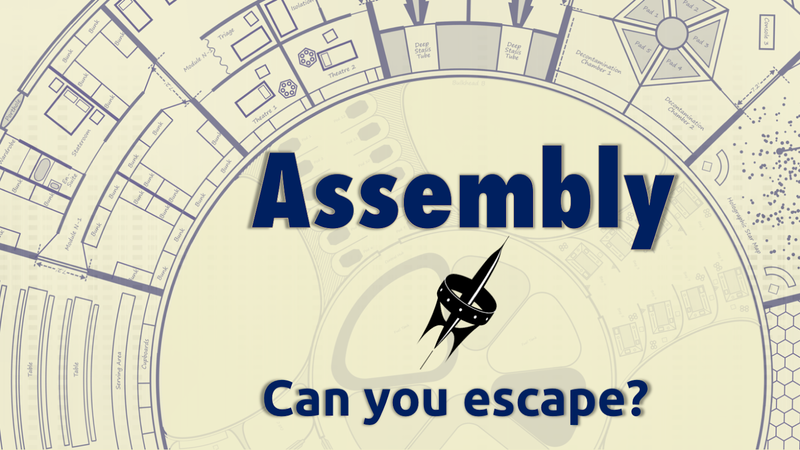 Assembly is a nail-biting card game where the prize for success is your life. Its expert use of science fiction tropes, simple puzzle mechanics, and teamwork makes it a lot of fun in a small package. Its size makes it ideal for keeping kids engaged on trips or killing time while a much more complex and convoluted board game is set up in the other room. What's more, the game's challenge is difficult enough that you'll truly feel proud of success, while not being so hard that you never win. One thing that could be seen as a negative is that the concept of the computer shutting down the lines of communication has to be enacted by the players, so if they're not paying attention (or simply choose to ignore it), the rule becomes worthless. The game does attempt to circumvent this by allowing some freedom in the level of communication allowed, but it's still up to the players to enact it. Otherwise, it doesn't seem like there's much to complain about with this one. So long as the size doesn't bother you, Assembly is a ton of fun in a tiny package. 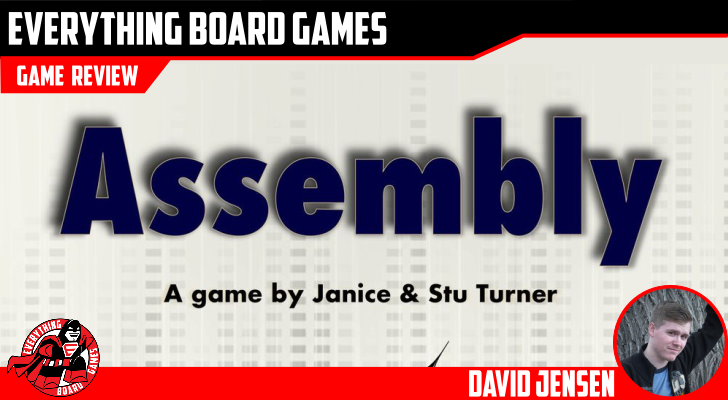 If someone could make a board game out of a Rubik's Cube, it would look a lot like Assembly. Fans of cooperative games like Pandemic and of puzzles will find this to be a perfect blending of the two. On KICKSTARTER now! Ends June 21, 2018.